For those of you who have been paying close attention, yes, this is number 44, not 43. I’ve skipped one - but never fear, hopefully before the end of the week I'll have that one ready for you! In the interest of full disclosure, I thought I was through with this series. I had 43 tops made and ready to show you - but as I looked at my leftover pieces, I knew that I could use up some more of those blues. I tried to make one I’ve got designed, but it involves a lot of piecing - lots of fussy stuff, and my heart wasn’t there. So I decided to put a hold on that one - maybe I’ll make it with greens and pinks and purples instead - or just scraps - but not upcycled blues. I decided instead to try something faster. What’s faster than a rail fence? Bronze Coins - part of my 2” series of quilts. I’d previously made one out of my 2” strips, so I wanted to make this one a bit different than that one. I did a quick search on google for some ideas. I’m usually not too thrilled with the look, but decided that I really didn’t want to throw away this many skinny, small scraps. My alternative was to USE them. So, I picked through many of my smallish bits and pieces and cut up 1152 strips that were 1.5”x4.5” I had looked at a lot of coin quilts on the ‘net and decided that I liked the “look” of this proportion - of coins to sashing. So, that’s all I did. 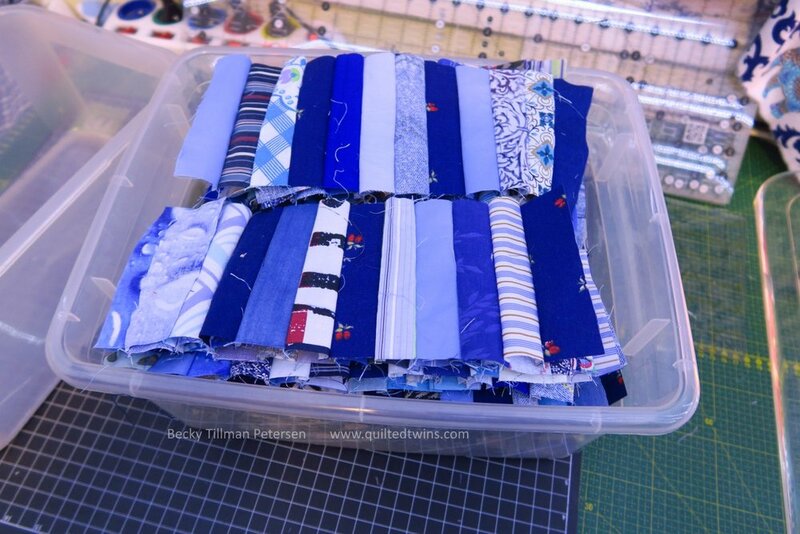 I cut up from my scraps almost 1200 strips - 1.5”x4.5” and I threw them into a container. I kept a piece of paper nearby and wrote down as I threw them in the bucket so I knew how many I had. This might make you laugh, but I counted and then marked how many I cut as I threw them into the bucket at one time. Cutting this many strips took, what felt like, almost as long as the initial sewing of them together into long strips! then made fours out of them and then make 6s out of them. I threw the 6s to one side and eventually sewed two of those together to make one “block” of 12 strips. For each row I needed 8 of these blocks. I knew I wanted 96” length, so that meant I needed 96 strips in each row since they would finish at 1” after being sewn into the top. Here are all the blocks made, but not sewn together or pressed yet. I went ahead and sewed 8 of these blocks together to make one long strip of 96 strips. 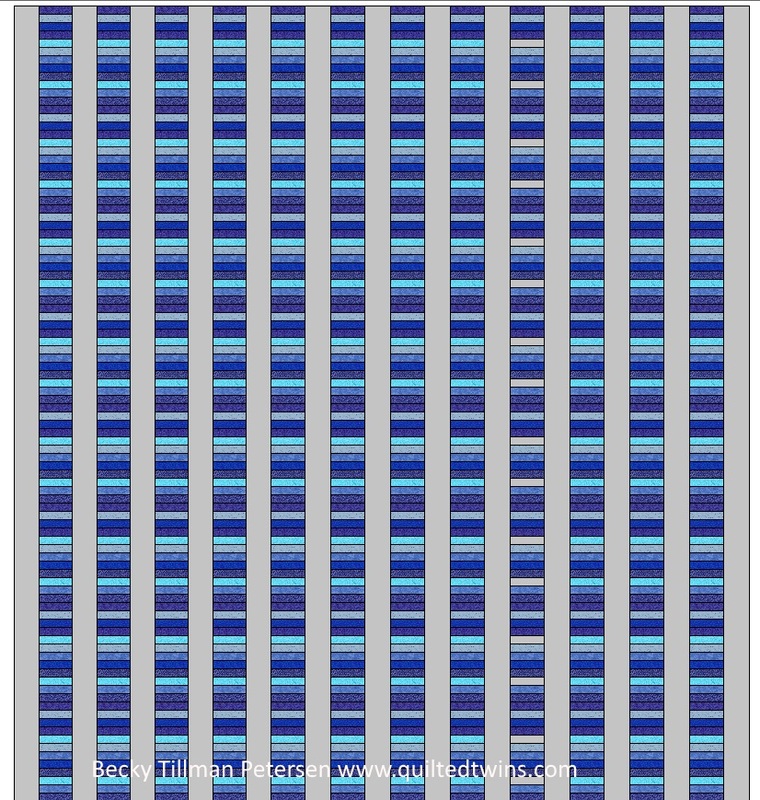 I made 12 very long rows. Then I pressed the seam allowances all one direction. Then I cut gray strips to 3.5” width, and sewed them together - thankfully I had enough of this gray second hand fabric (sheet or duvet cover - I think it was a sheet) - seamed them so they were long, measured off 96.5” and cut. 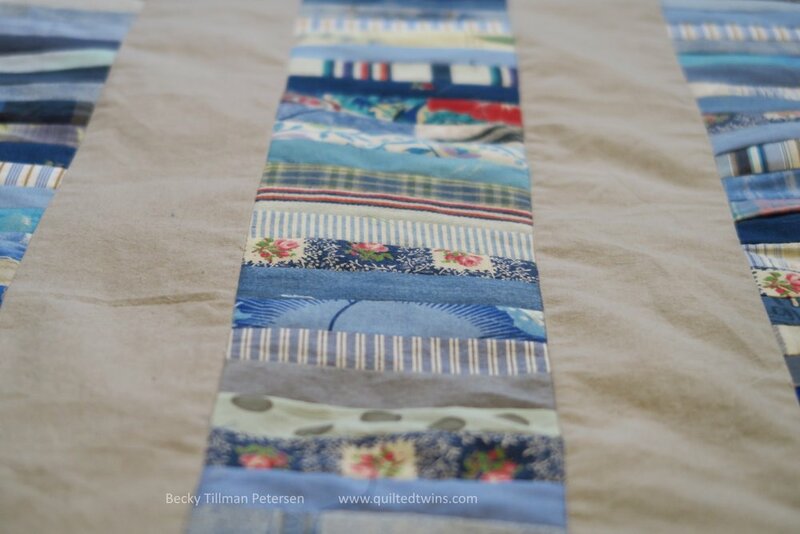 I then sewed my nicely pressed long row of 96 strips to my sashing strips. I did press in a mark at 1/2, and 1/4 and 3/4 of the way along the sashing strip and matched up the centers of the strips (48 strips, and then 24 strips from each end) so that I could ease or make the rails fit the sashing. In summary - I needed 13 rows of gray sashing cut 3.5”x96.5” - I pieced them and then cut them to that length, plus my 12 long rows of 96 1.5”x4.5” strips. The quilt finishes at about 87”x96”. 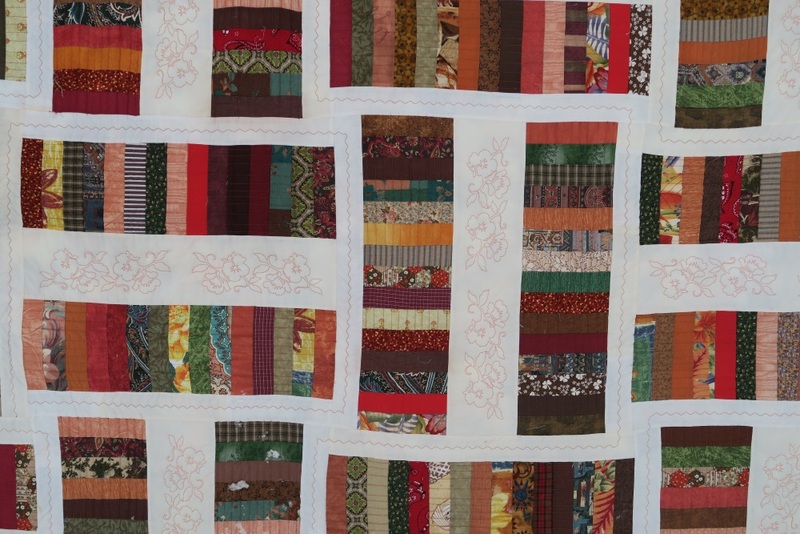 I am pleased with it - and I like it probably as much as I could any coin quilt! This is as much of a pattern as I’m going to write. It’s super simple. I don’t think a special pattern is needed. I am putting this picture on the upcycled blues page, though, for reference. I am back up to 5 tops I still need to quilt from this series! And I have 2 more that I’m working on. And that’s what’s been happening in my world.